Problem with Pulls – Desk Update! I am so close to finishing the vintage desk but have run into a problem. 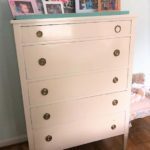 The drawer pulls that I always purchase at Home Depot are not longer there – yikes! I have tried different pulls that I have in my stash and looked online but don’t want to wait for shipping. I’m off to Lowes today to see if they carry any decent ones. 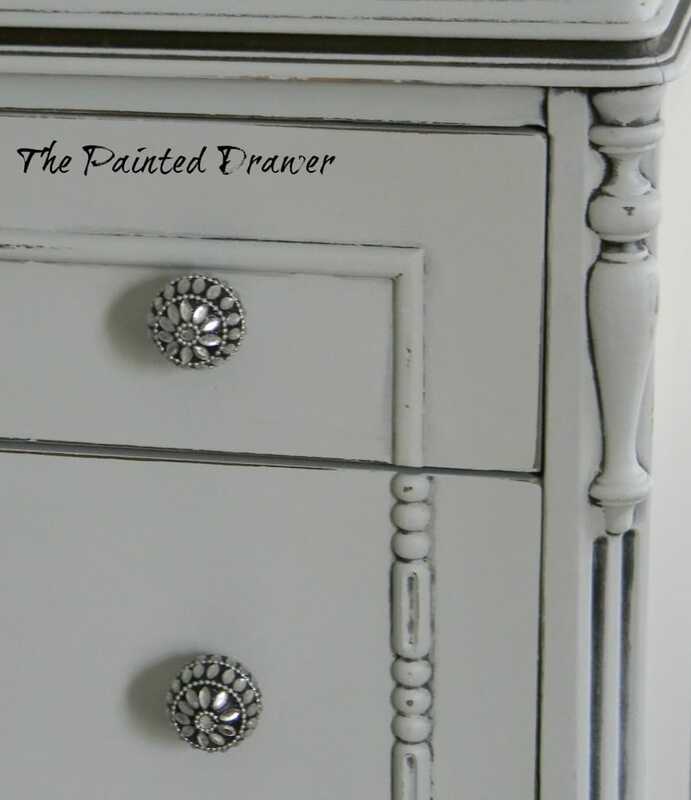 Drawer pulls are like jewelry to a piece, they set it off. Or shoes to an outfit – that finishing touch! Here are pics of gold (yuck) and a glass one that I had (not bad but I only had the one and need 10). Wish me luck! 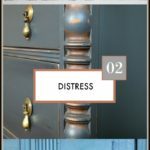 Here are related post about Drawer Pulls. Seems fitting for today! 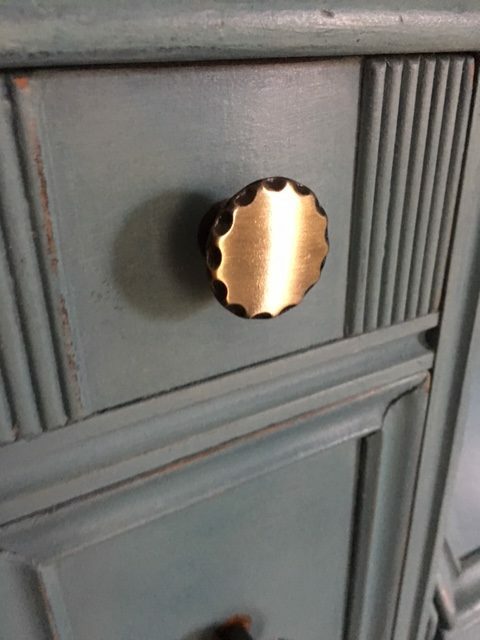 Sometimes, all that is needed to change a piece from one style to another are different drawer pulls. 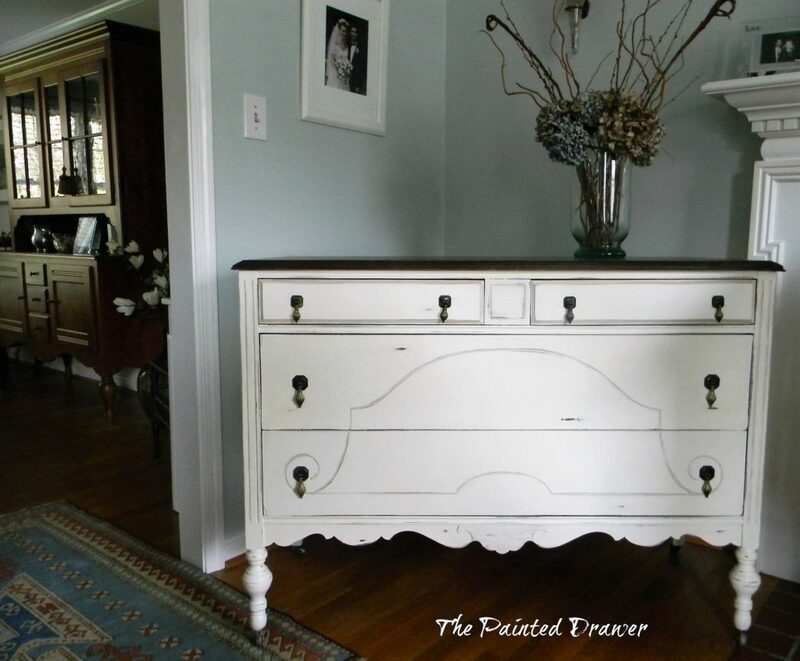 The original wooden pulls give this dresser a very farmhouse look. 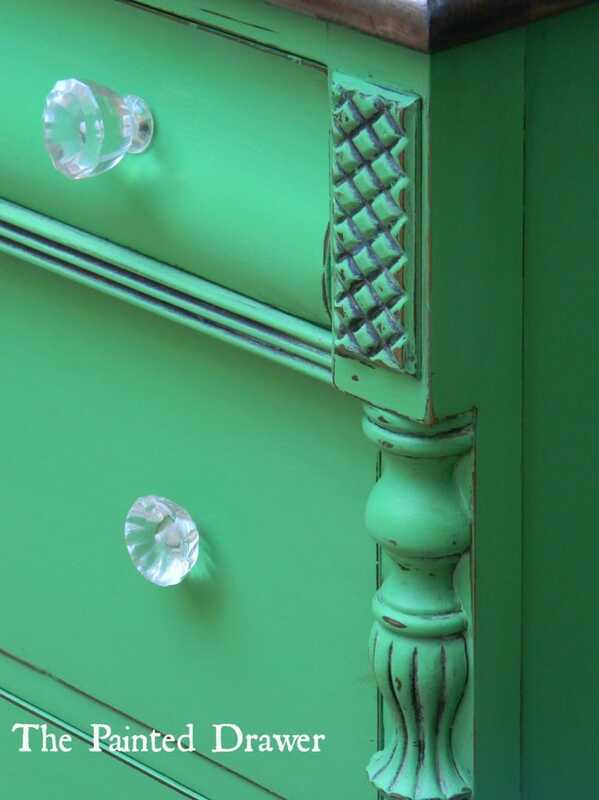 While the sparkly pulls give this dresser a more glam feel. 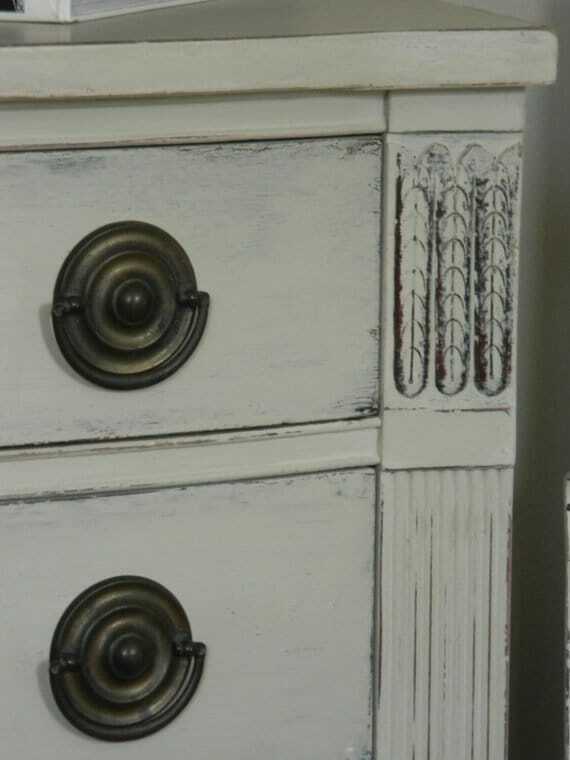 White knobs make this so very beach-chic! 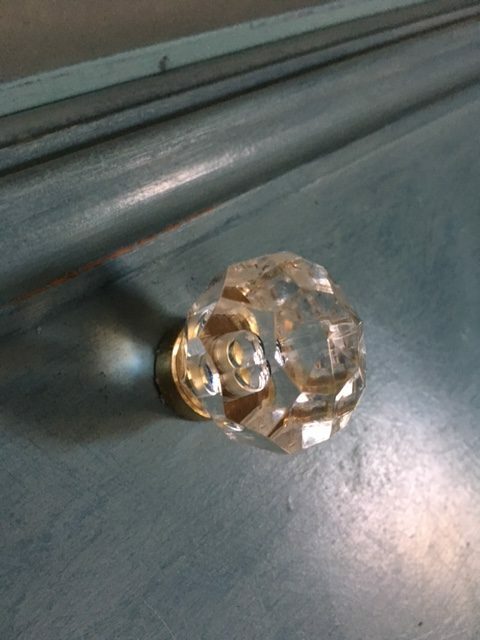 These glass pulls gave this piece sparkle and light against the green. Original pulls always give the piece a more vintage feel. To paint or not to paint? It depends on the piece. Sometimes the hardware is too difficult to change out (as in the piece I am doing now) so I just add a bit of paint and give them some charm. The Shabby Glam dresser’s original gold pulls set of the gold stenciling perfectly, so they were left as-is. I feel they gave the piece a great vintage feel that fit the finish well. 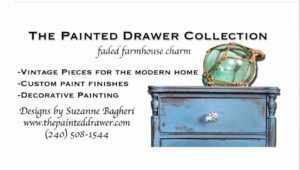 I always keep the cost of the drawer pulls in mind when purchasing a piece. If the piece you are contemplating has pulls with double screws (as above) be very careful if one is missing. 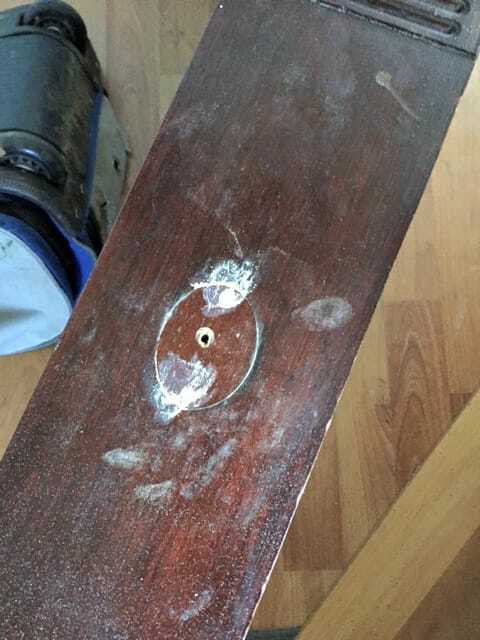 Sometimes the holes are not drilled in a “standard” measurement, so you will find yourself having to drill all new holes for newer pulls to fit through. 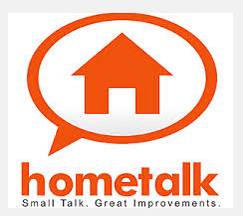 This plus the cost of all new hardware can really put you back in your time and investment. I have left pieces before that are missing a drawer pull for that reason. 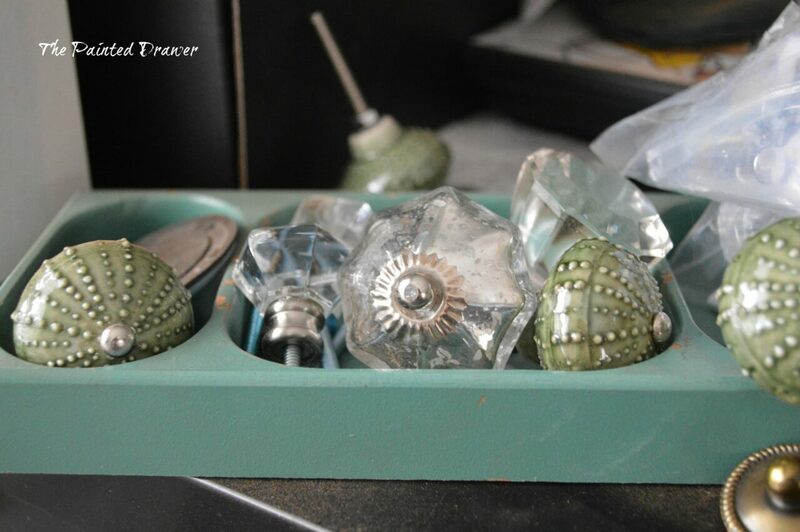 Most girls love their jewelery boxes, I happen to love my box full of drawer pulls! I’m busy working on this great piece that I picked up a few weeks ago. It is in pretty good shape but missing all of its hardware. 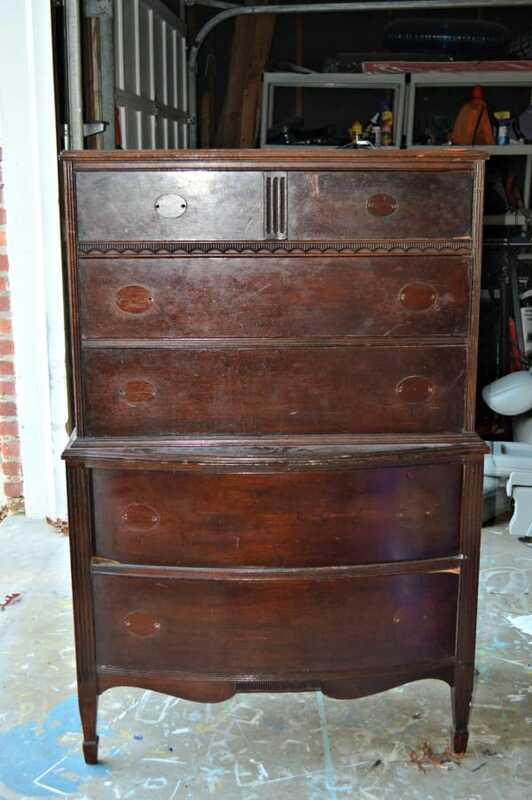 I can tell from the outline left on the drawers that it originally had Hepplewhite drawer pulls. I actually have a few in my stash but decided to take this piece in a different direction. Hence, new hardware! In this case, I am changing out the double screw pulls for single screw knobs. I start by placing my drill bit in the middle/center of the original holes and drill my new one. I then take wood filler and apply it into the original holes from both the front and back ends. Sometimes, the back of the drawer will split slightly from drilling. 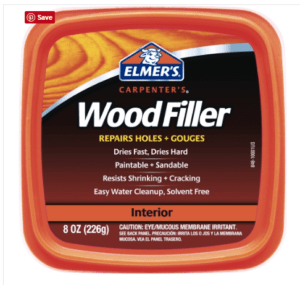 In this case, I gently pop off any sharp wooden ends and if I have to, fill and sand it to smooth it out. Let this sit and dry for a half hour and then gently sand over them (I use 100 grit sandpaper for this). I repeat this process at least three times until the holes are totally filled and completely level so they won’t show under the new paint. Fill, sand…fill, sand..fill, sand. This is a tedious process but so worth it in the end. I then can have fun when all done and add some pretty, sparkly pulls! « For Sale! 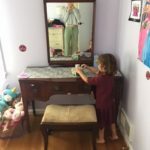 Mirrors and More! 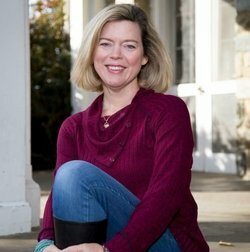 I’ve been following and am enjoying your blog for several months now. I am a beginner at painting furniture, but have recently finished several pieces for our new beach house. I have a question…is it okay to interchange different products from Annie Sloan & General Finishes?? 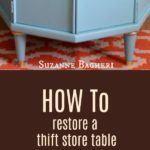 For example, can I paint a table with General Finishes Chalk Style paint, then use Annie Sloan dark wax, and then seal it with GF Top Coat? Or, can I paint with Annie Sloan & then seal with GF. Hi Jacqueline! Yes, you can use both products together. I like to use AS wax for a hand rubbed finish over GF chalk paint too. 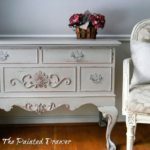 Also, if you use the GF Flat Out Flat topcoat, it can be applied over AS chalk paint as well. The only thing you can’t do is AS wax over GF milk paint. Their milk paint is acrylic and the wax won’t absorb. Hope this helps and best of luck with your projects! I have the same problem choosing hardware. The wrong hardware can ruin the entire piece. The glass ones look nice against the blue. 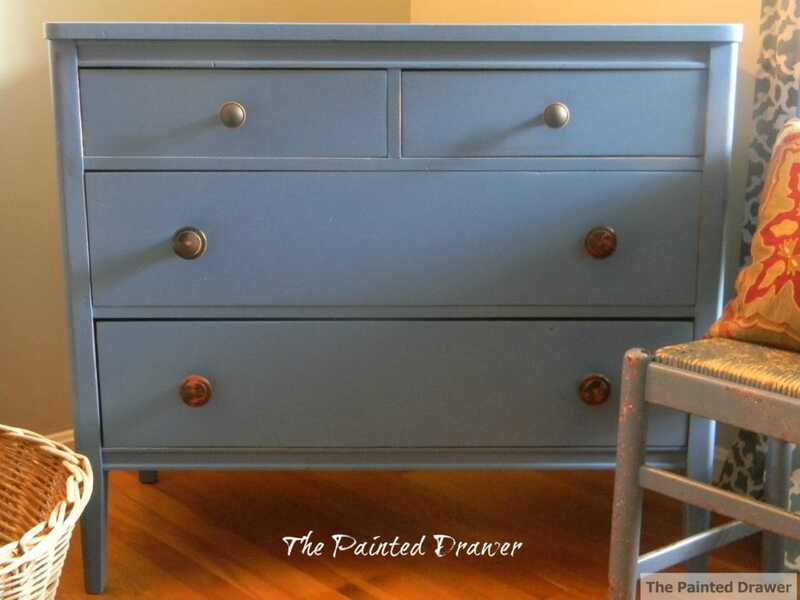 Or, maybe go with the original wood handles and paint them a base color and a top color the same as the blue then sand off the edges to reveal the base color. Good luck! I’m sure whatever you choose will be perfect. I’ve been wanting to ask you… what happended to your other website design? The one you had a few months ago with the gold lettering? Hey Vicki! I switched my site design when I switched hosts. This one has more options and I like the more modern feel of it. Took time to get it looking decent and running properly but I think it’s getting there! Did you look at Hobby Lobby? Not sure what you’re looking for. Places to try. Ace, Lowes, or on line at Van Dykes Restoration Hardware. They sell all kinds od neat stuff. They work for because I love old looking stuff. Ikea has more modern stuff. Thanks for the tips! We don’t have Hobby Lobby near us but the online store I can try in the future! Thanks! 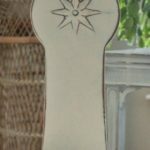 I have had success in using the IOD(Iron Orchard Design) medallion and border molds with paper clay, attaching them to plain wood knobs or old pulls. If I knew how to attach a photo here I would show you kne of mine. Hi Carol, that sounds awesome! 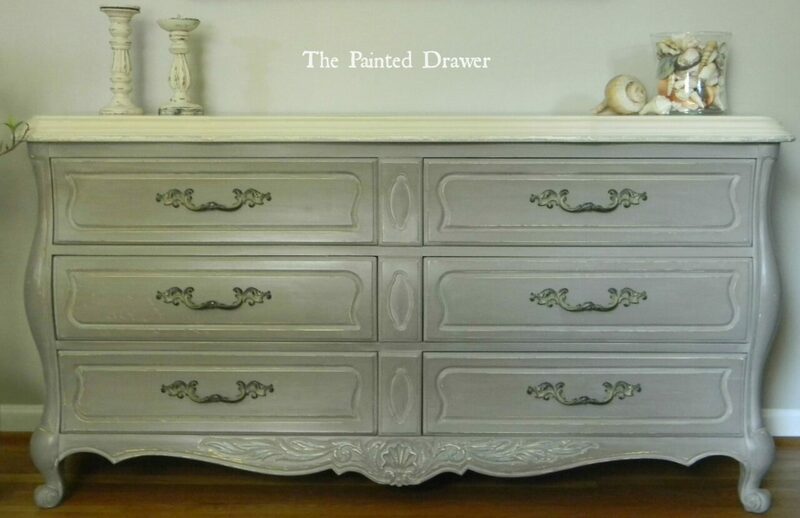 Send me a pic at Painted Drawer@gmail.com because I would love to see it! 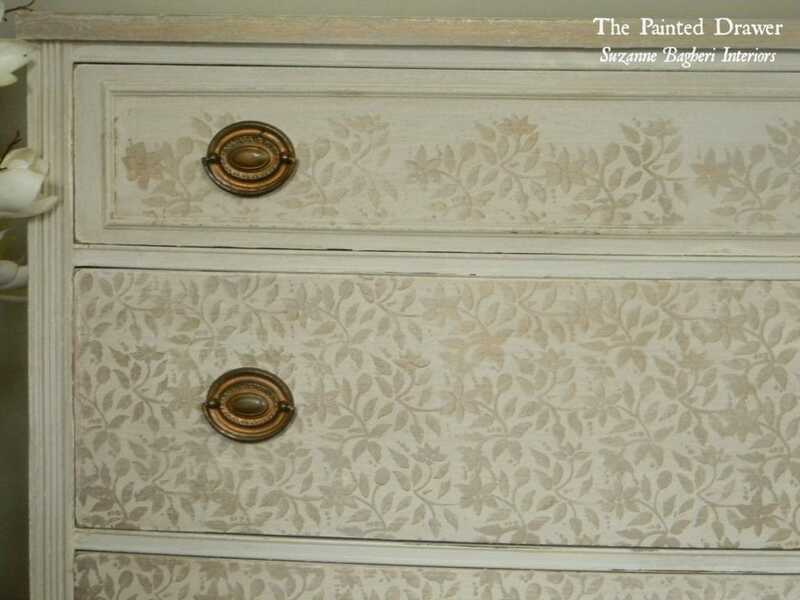 I saw the beautiful dresser with the stenciling in your blog about the pulls. Do you remember where you purchased the stencils and what type of gold paint you used? I would like to replicate that on a chest that I have had for a number of years. I couldn’t figure out what to do with it and this stenciling would be a perfect solution. Thanks! Hi Fran! The stencil was purchased at ACMoore and I don’t have the packaging any longer so am not sure of the pattern – sorry! 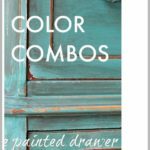 The paint was Martha Stewart but is no longer sold. I would suggest going to your local craft store to find an alternative. Apologies for not being much of a help! I love how you show that by changing the knobs it changes the look. Hobby Lobby sometimes has pulls on sale, and usually a good selection. 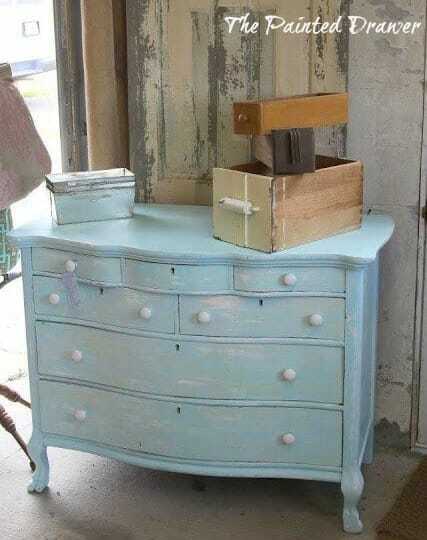 Love the shabby glam dresser. What is the stencil or should I say where did you get it and what is the name if you can remember. If you’re anything like me, you don’t have the foggiest idea, LOL! Hi Bonnie! The stencil was from AC Moore but I’m sorry, I’m not sure the exact make-pattern. I no longer have the packaging that would tell me. The gold paint was Martha Stewart but it is no longer available. I now use Cire-a-Dorer gold gilding wax. Sorry this hasn’t been too much of a help!